Thought I had posted this already, but looking back through the blog evidently not! So as I had to revisit the site for another project, seemed a good time to post. 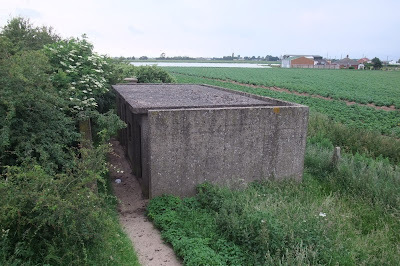 Just north of the anti-tank cubes in front of Goose Hill, a series of linear depressions in four rows can be seen (much the same as those at Shingle Street which I know I have posted on!) and are quite possibly evidence of a minefield. Above: Aerial in which the series of craters are clearly visible. 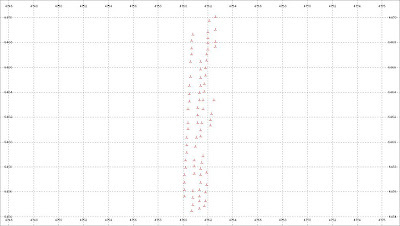 Bottom shows a GPS plot of four rows. Documentary evidence shows minefields in the area from 1940 onwards, but the only document I've found to date which states the type of minefield is from 1942. 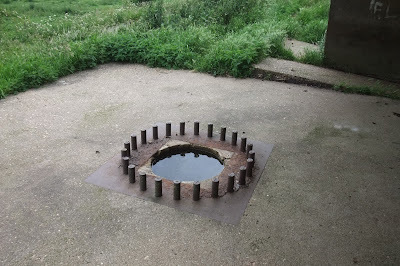 The extent of the minefields in this area were certainly increased between 1940 to 1942. 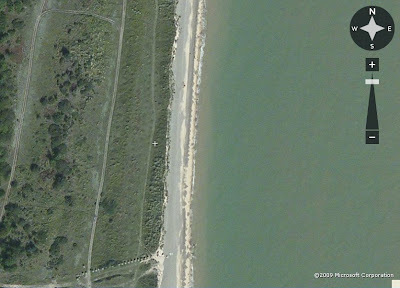 Above: The craters are in the dunes, just to the north of the line of anti-tank blocks. Middle image shows one of the craters, with the tank blocks in the distance while the crater in the bottom image is quite evident. So how does the series of small craters that exist today fit in with the documentary evidence? 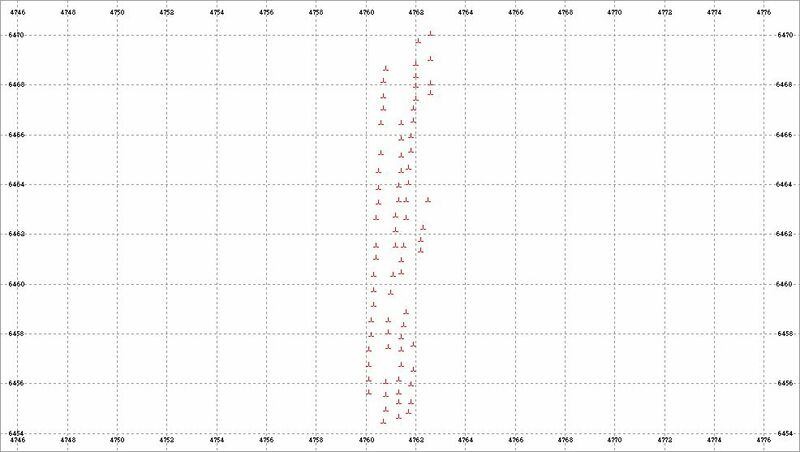 The distance between the centre of each crater in each row was approx 18 to 20 ft. 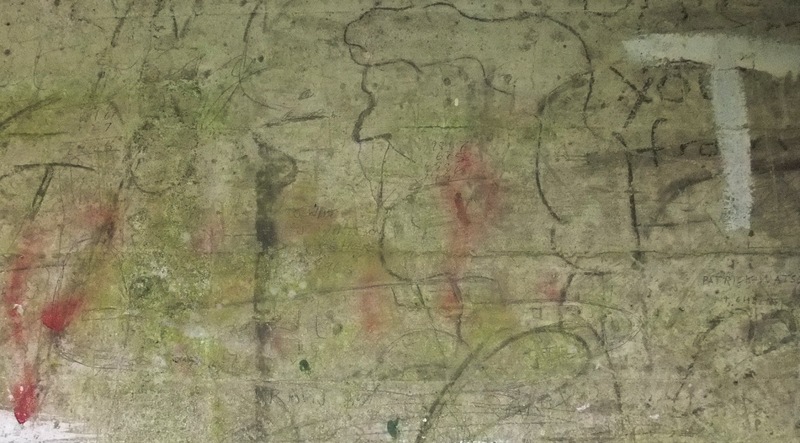 There are four rows of craters, which may correspond to the 1942 map - this shows two rows made up with 120 mines and two rows made up with 105 mines. The best preserved craters are approx nine ft in diameter and two ft deep. 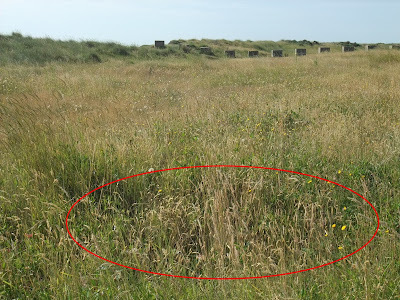 I don't know the size of crater a Beach Mine would make - the only mention of mine craters I have found is for anti-tank mines which may make a crater up to five ft wide and three ft deep in soft ground. 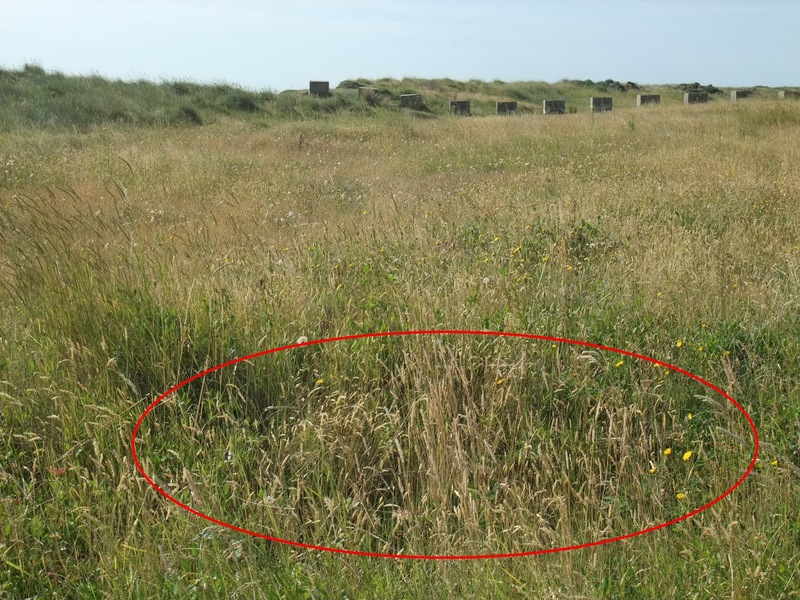 With the ground in this area being vegetated shingle and sand, it should be remembered that the original dimensions of the crater will not be preserved today after 70 odd years! So why would the mines have exploded? The explosion of minefields during the war was not an uncommon occurrence. Stray dogs were a often a cause, exploding one mine which either caused sympathetic detonation of a number of mines or the the blast would cause compression of the striker springs of adjacent mines if placed too close together. 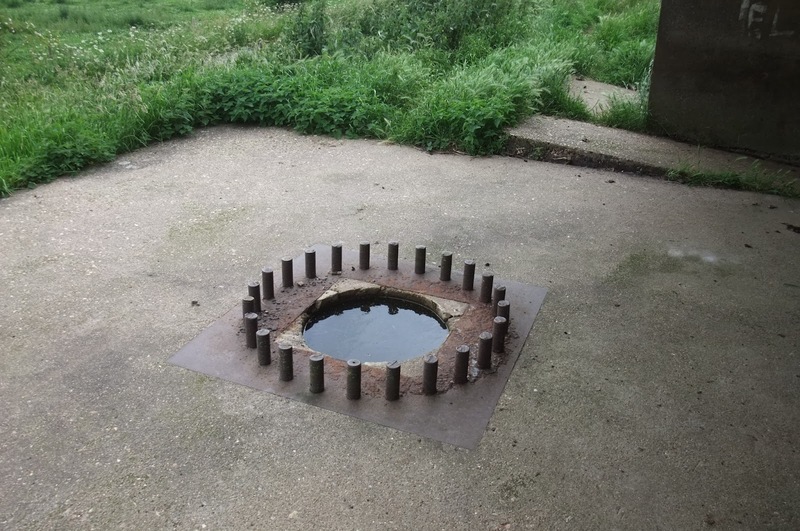 The mines may also have been deliberately destroyed in situ - either to remove the minefield completely or in preparation for laying a new minefield. To date I have found no documentary evidence for an explosion or removal of mines in this area, although it may be sitting in the depths of my hard drive somewhere! I should of course end by stating that they may not be mine craters at all - it would not be the first time, nor no doubt the last time, that I mistake another feature as WW2 evidence! If anyone knows otherwise I would love to hear! WW2 and Nuclear Energy have both left their mark in Sizewell's Landscape! As well as these craters, I also noted some remains of 'dragons teeth' i.e. under water spikes. These were of two types: 12" by 5" girder laid at 15 ft intervals and a smaller type. Above: Top three images show the larger type of under water spike. Fourth image shows the smaller type of spike. 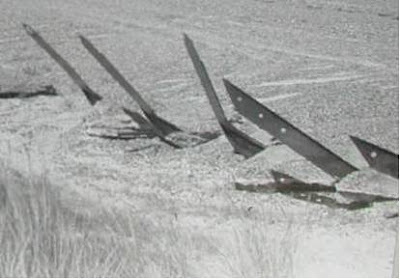 Bottom image shows remains of both types of spikes, just after the war. Finally, the 1942 Obstacle Crossing Demonstration, a popular thread in this blog, is now on the website under the Training Tab, with the outcome of the demonstration having come to light on my last visit to the National Archives. Last week I was up in Lincolnshire on a work related trip and managed a quick 15 mins to visit the Emergency Coastal Battery at Freiston. This battery was manned by 321 Coast Battery. 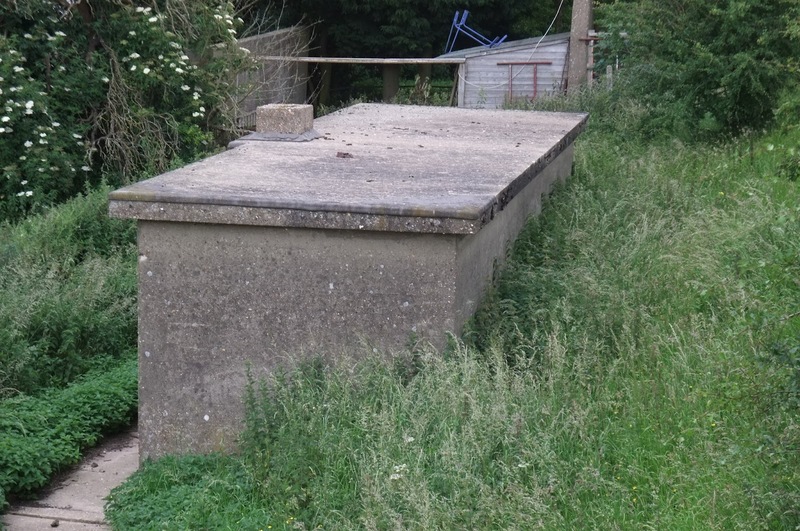 This is arguably one of the best surviving Emergency Coastal Batteries in Britain. The two holdfasts for the 6" Mk VII guns are still in place as is the overhead cover of the gun emplacements and both Coastal Artillery Searchlight Emplacements. The battery sits on top of a seawall, although post war reclamation of salt marsh means the seawall the battery sits upon is no longer on the shore line. 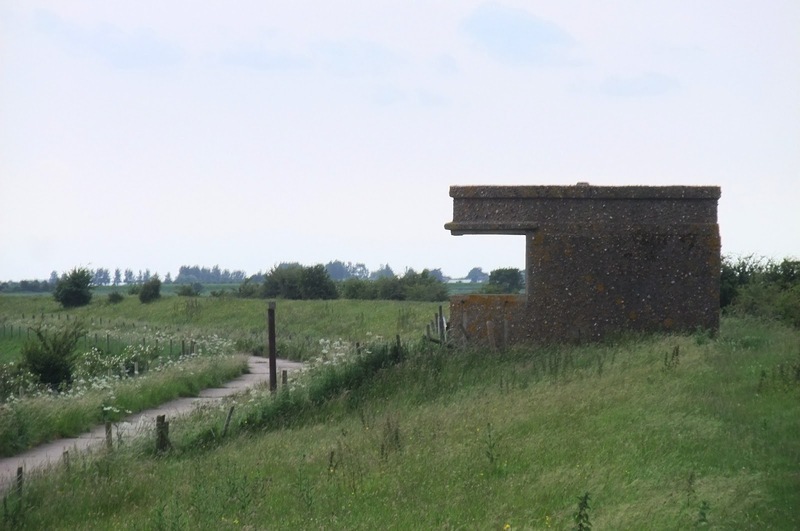 Other buildings associated with the battery can be found on the rear side of the embankment. Above: The two gun emplacements. Bottom image shows one of the holdfasts for the 6" guns. 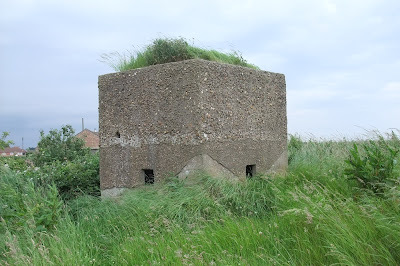 According to William Foot (Defended England 1940), the emplacements had been disguised by adding pitched roofs to their tops so they looked like houses. 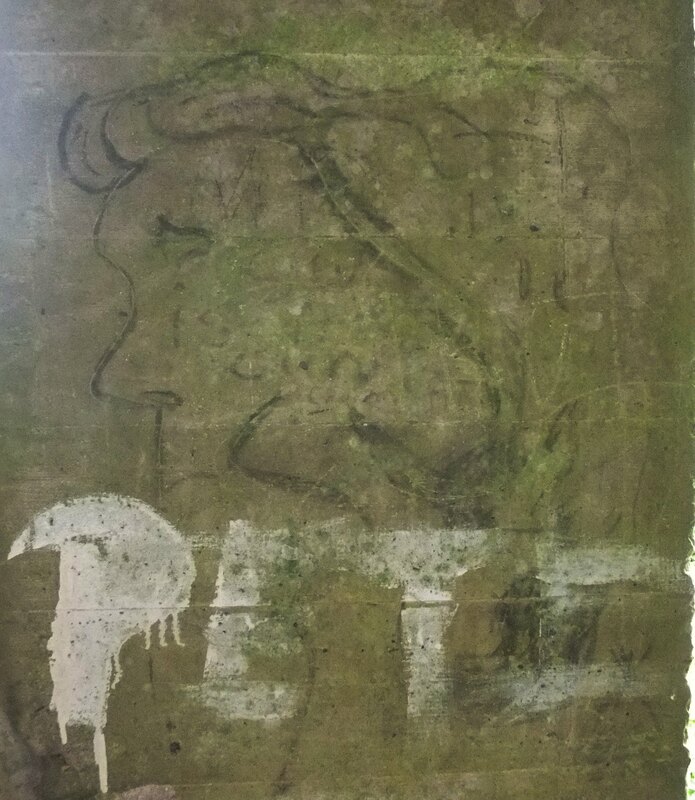 This camouflage was still in place into the mid 1950's. 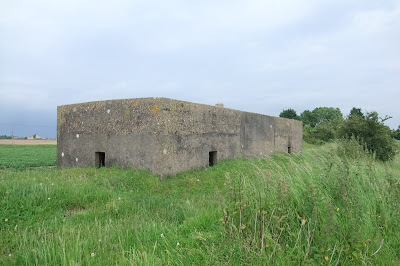 Loopholed blast walls can be seen protecting the rear of the emplacements. 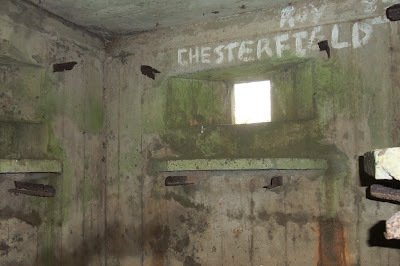 Above: Top image shows one of the Searchlight Emplacements. Next three images show a so called Lincolnshire-type three-bay pillbox for local defence of the battery. 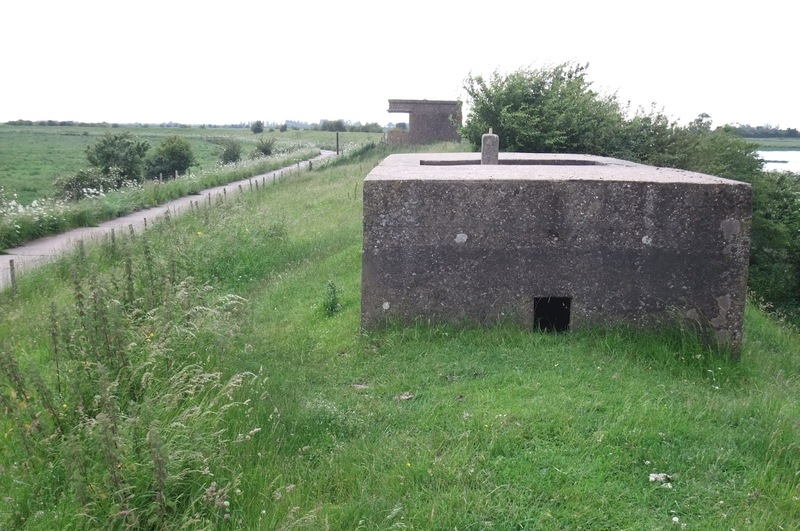 The pillbox consists of two infantry chambers with an open emplacement in the middle with a mount for a light machine gun to act in an anti-aircraft role. William Foot notes that the pillboxes in this area had been darkened with mud to hide the sheen from the concrete and earth and grass had been applied to break up their outlines. 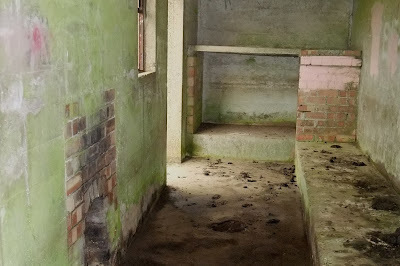 Bottom image shows the interior of one of the infantry chambers showing concrete weapons shelves. I don't know the purpose of the four pieces of angle iron protruding from the wall around each embrasure. Above: some of the buildings to the rear of the gun emplacements. 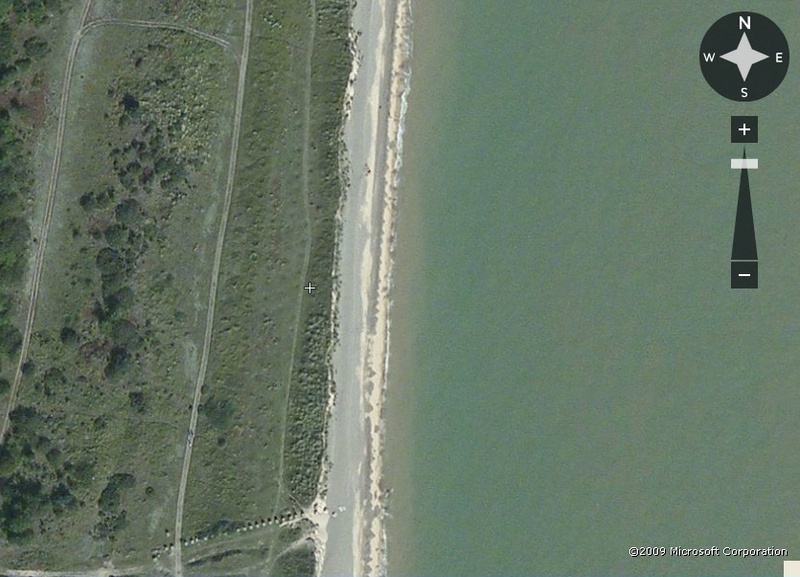 Top image is I think the ammunition stores. 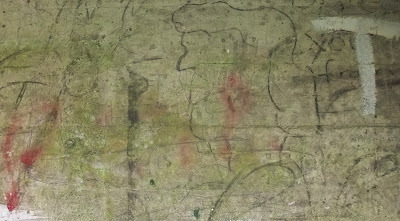 Second down is probably some sort of crew shelter (note the fire place in the interior shown in the third image). Bottom two images show graffiti dating from the war in the interior of the crew shelter - can you pick out the drawing of the Messerschmitt Bf 109 in the forth image!! 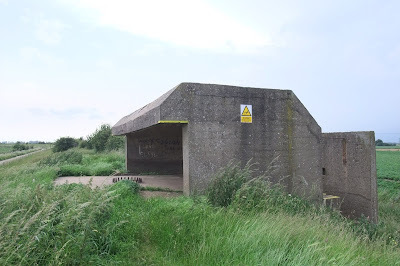 Last image shows a type 22 at the entrance to the car park at Freiston Shore. 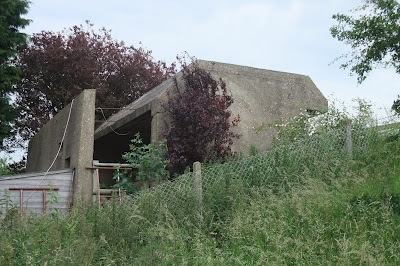 The extension to the roof was no doubt to add some sort of anti-aircraft emplacement - I don't know if the walls are hollow and have been filled in (did not have time to figure out a way onto the to).